Sentiment Analysis – It is the Next Big Thing in SEO? Sentiment Analysis is the top trending topic when it comes to the data and analytics world. There are a lot of things that you need to know about this term. Well, Sentiment Analysis is a type of method that can be used for analyzing the positive as well as negative emotions related to a specific series of words. The impact of Sentiment Analysis is also increasing day by day in the SEO world. It is not only beneficial to analyze the text only but also the speed. With the help of this, you can identify whether the author is stating the positive or negative about the topic. The popularity of Sentiment Analysis is also increasing due to numerous reasons, and you need to check them out. It can help you can also come to know about the overall attitude of the audience, and it is also useful for many other things. It can be used to explore the opinions in reviews which can be very helpful for your business. Well, a company has thousands of reviews about their products and services. You need to measure their sentiments to understand the feelings of the people about your efforts. Opinion mining is another term that is also used to refer to sentiment analysis. The main task of sentiment analysis is to find out the emotional tone of the user behind using a certain set of words or keywords. Whenever we search online, we use some words. Some of them can be regular words that everyone uses while some can be specific to users. The job here is to analyze what the user is thinking or looking to find through using specific words in a given context. Sentiment analysis is very important especially in the context of social media. It is one way of getting an idea about the public option on certain issues. Today, people discuss anything and everything online. In such a scenario if we have the means to measure or analyze the public mood or opinion on certain topics it can help brands to improve customer experience. One of the foremost things a brand needs to do today is making things easy for customers.No matter where you are if brands can do this it can be a win-win situation for both the brand and the user. Such public moods and opinions can have a significant impact on the global market. There are many reasons for which the Sentiment Analysis is getting fame. Check out all these reasons to get an idea about its importance. Well, it is not only beneficial to review data but also for measuring the opinions provided by the customers in the comment section. It is important to know what your customers are feeling about your brand or company. It can help you to make improvements and to take the other steps for achieving the business goals. You shouldn’t only think about the content that works, but you also need to analyze the opinions of the customers.To craft better content, you need to measure the opinions or the reviews of your customers. It is beneficial to craft the right type of content according to the interest of your customers. In this way, you can easily improve your brand awareness and build up strong customer experience. With the help of Sentiment Analysis, you can come to know about the spelling errors and the other mistakes which are distracting the engagement. With the help of Sentiment Analysis, you can't only improve the content of your website, but it also helps in improving the SEO of your website. Well, this process will help you out to find the relevant topics in which your audience is interested. In this way, you can get more visitors for your website in a short time. It can also help in obtaining more insight into the keywords. All these things are really helpful to win the competition. You can also improve the SEO of the product descriptions and the Meta tags to reach more and more customers. With the help of Sentiment Analysis, you can easily identify the spelling errors of the content. You can also come to know about the broken links of SEO and many other mistakes in the content. 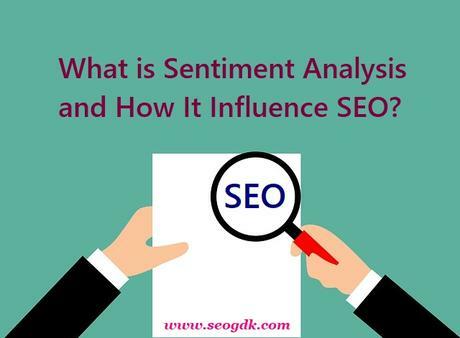 The growing demand for Sentiment Analysis can help you to understand its benefits and the use in the SEO world. You can visit here to avail the SEO services for your business website to make it better. It is really important to understand which people are talking about your products and services. To identify it in the right manner, you can consider the option of Sentiment Analysis. You can't find anything much better than it. With the help of this process, you can generalize the feeling of your customers within a short time. It will categorize the posts in three different parts as positive, negative and neutral. People are giving more preference to it due to its numerous benefits. Some of the benefits that you can get with the help of Sentiment Analysis are as follow- · It can help you to listen to the voice of the customers with the help of their reviews or comments. · You can easily solve the problems by analyzing the comments or reviews of your customers to protect the online reputation of your business. · With the help of this, you can come to know that what types of posts are beneficial for driving more traffic to your website. Promote SEMrush and Earn Dollars Through BeRush Affiliate Program!